Audience members with Creator/Performer Geoff Sobelle (center) in “The Object Lesson” at the Kirk Douglas Theatre. Running through October 4th, be sure to catch The Object Lesson at the Kirk Douglas Theatre in Culver City. 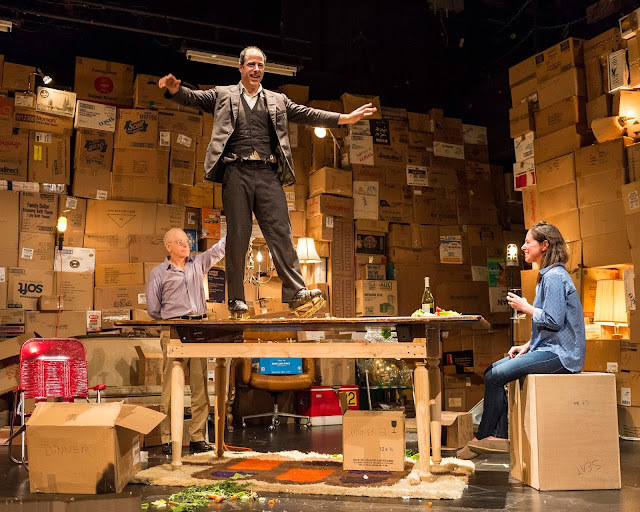 With boxes stacked to the ceiling, actor-illusionist-inventor Geoff Sobelle (all wear bowlers, Elephant Room) returns to the Kirk Douglas Theatre and transforms the space into an epic storage facility of gargantuan proportion. Audiences are free to roam and poke through the clutter in this immersive theatrical installation that unpacks our relationship to everyday objects. Breaking, buying, finding, fixing, giving, losing, winning, trading, selling, stealing, storing, collecting, cluttering, clearing, packing up, passing on, buried under…a world of things. Hilarious and heartbreaking, The Object Lesson is a meditation on the stuff we cling to and the crap we leave behind.